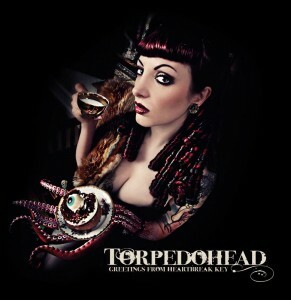 In 25 words or less: Straight ahead, high octane rock n’ roll with massive hooks, sing-along choruses and blazing guitar solo’s, you know, all the fun, essential stuff, that’s what I’ve come to expect from Torpedohead. At May The Rock Be With You we take great pride in uncovering awesome rock from all corners of the globe to share with you, our readers. But sometimes, that awesome rock finds us, before we find it. That is the story of Torpedohead, who we were alerted to way back in 2009 by their singer/guitarist Sven Spacebrain. That first introduction was their debut album Lovesick Avenue, followed on by the EP Let’s Go For A Ride and now comes the eagerly awaited by me, new full length album Greetings From Heartbreak Key. Straight ahead, high octane rock n’ roll with massive hooks, sing-along choruses and blazing guitar solo’s, you know, all the fun, essential rock n’ roll stuff, that’s what I’ve come to expect from Torpedohead. The bang and crash opening of Gasoline sees the band at their heaviest and when the vocals of Sven Spacebrain hit, I can’t help but be drawn to comparing Torpedohead to the incredibly early days of the Goo Goo Dolls when they were a raw and rambunctious punk rock band, but who could effortlessly blend anthemic power pop hooks – just as Torpedohead deliver all through Greetings From Heartbreak Key. The opening three tracks don’t back the intensity away a notch, it’s full speed ahead for the best part of 10 minutes. Rock N’ Roll Satellite has a bluesy swagger that would be right up the alley of anyone that loves the solo output from Hanoi Rocks frontman, Michael Monroe. The fast and furious Moonshine Highway is a track I was initially familiar with from their past EP release Let’s Go For A Ride, whilst the polar opposite Red City Lights is just simply acoustic guitar, vocal and a hint of harmonica. Sven Spacebrain’s ability to write guitar riffs as infectious as a chorus is exemplified by the opening of Black Rain, which combined with a hefty dose of cowbell sees me hitting the rewind button immediately. But importantly, the rest of the song delivers big time – a super catchy chorus and some tasty lead guitar work. I think this album can be best summed up by the fact that the best track Rotten Radio is tucked away as the very last track – I mean seriously, one of my favourite anthems of 2012 and they can afford to slot it in as the last track of the album…that’s how damn strong this album is from start to finish! For those that love classic, riff infused, rock n roll with a harder punky edge, but still high on anthems, then Torpedohead could very well be one of the best things you have never heard!